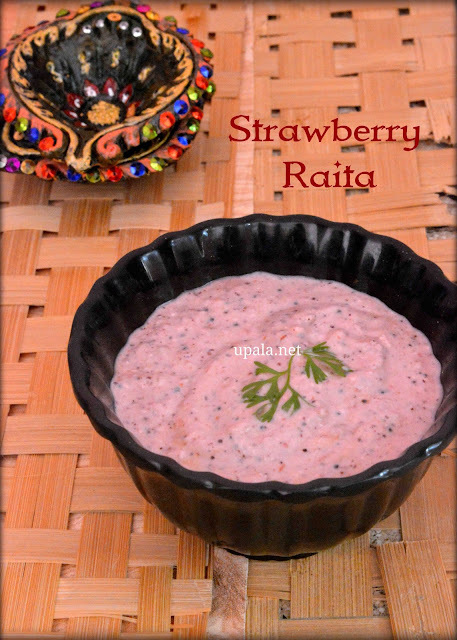 Strawberry Raita/Strawberry thayir pachadi is unique and wonderfully tasting raita prepared with Strawberries. This cool and refreshing raita gives a mix of sweet and tangy taste. Strawberries are rich in Vitamin C and offers us a wide range of health benefits. If your kids or family members are not a big fan of these Strawberries, try this Yummy Strawberry Raita recipe so that they will not miss the nutrition which these cute Red coloured berries are offering. 1) Heat oil in a kadai and add Mustard seeds to crackle. Now add Strawberries and green chilli, fry till they turn mushy. Add jaggery to cooked mixture and transfer to a bowl to leave it to cool down. 2) Add grated coconut, strawberries to a mixer and give 1 pulse. 3) Transfer the ground mixture to bowl. Then add salt and curd to it and mix well. Yummy Strawberry raita is ready. 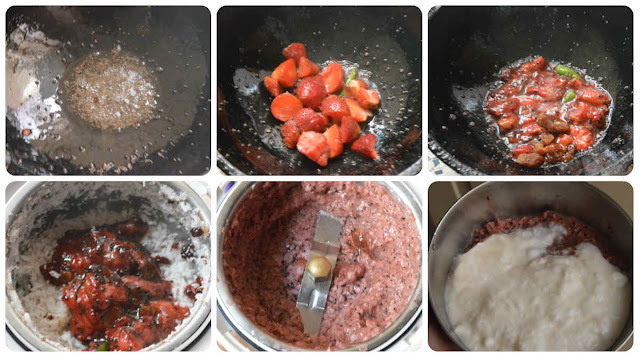 1) Strawberries cook fast, so no need to fry for a long time.